Going into 2019 you’re probably wondering what the top restaurant marketing ideas are going to be. Already, 2019 is looking like a whole different world where brand new restaurant marketing ideas are the only way to success. Changes to the techniques, tactics, and more mean there have been a bunch of changes you might not be on top of. Thankfully, we’ve examined the trends, dissected the thinkpieces, and put together a list of the top restaurant marketing ideas for 2019. To have success next year you don’t necessarily have to do all of them, but implementing as many as possible as well as possible will help you overcome your competition and achieve restaurant marketing success. 2018 saw brands and businesses double down on their ‘pivot to video’ and create a whole host of Instagram video content. The best examples of this drove followers, reservations, and more. This trend is set to continue as Instagram pushes and promotes its IGTV concept. Centred around showcasing longer-form video, IGTV is Instagram’s alternative to YouTube and Facebook Watch. The standalone app shows off longer video content and video previews are shared into the main app’s feed. Adoption rates have been slow and steady so far and Instagram is looking to push the service more and more next year. When it does this, it’ll be rewarding the very best content. Video has already been shown to generate significant buzz around food and restaurant businesses. Businesses like BuzzFeed Tasty and Eater have been been built on the back of food video. Videos showcasing food are incredibly popular on Instagram because they generate an emotional response. When people eat food they taste, smell, and feel. Food videos make us feel some of those responses and more. The best food videos get people salivating and hungry because they make people want to eat. 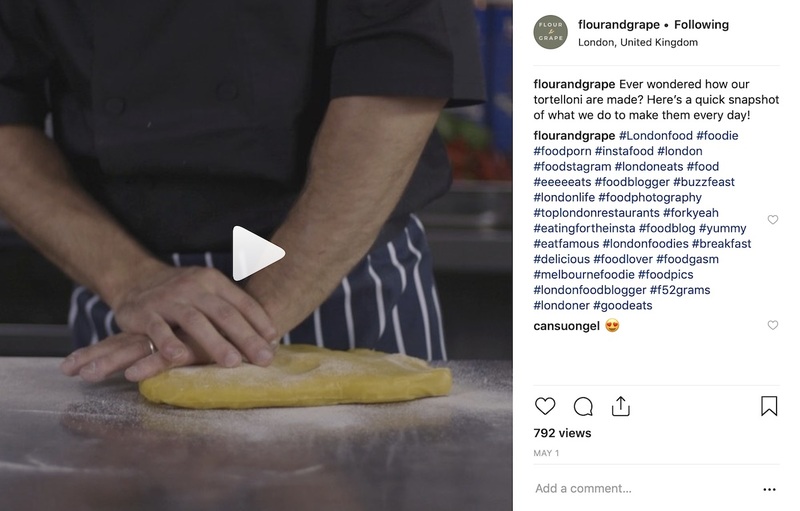 For restaurants, success with Instagram video and IGTV will mean creating a series of high-quality content to get people salivating. IGTV has been pushing up the production quality of video shared on Instagram. People who have found success already are those who have invested in high-quality video and used it to show off their outstanding food and drink. Here are a few great examples of Instagram video content that should help inspire you to start with your own. Incorporating any of these types of video into your restaurant marketing strategy will help boost you to success. 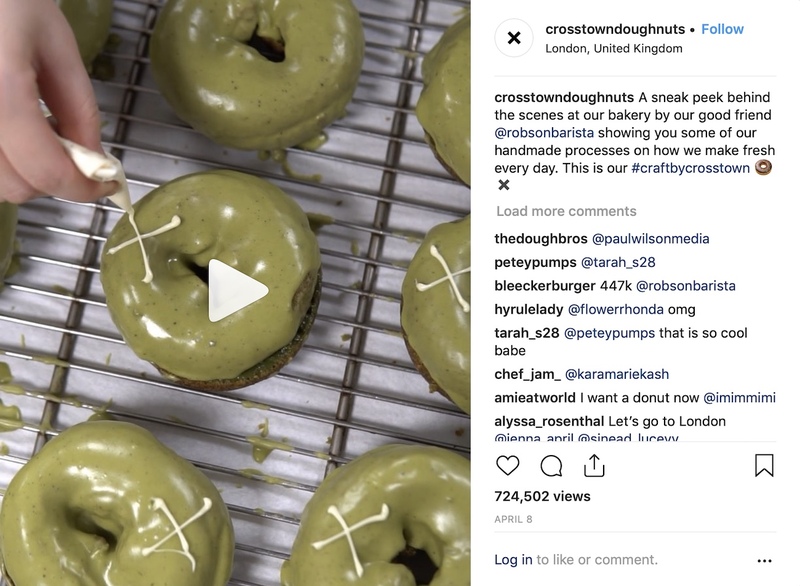 This video by Crosstown donuts is an outstanding example of great Instagram video content. It features food that’s beyond delicious: donuts, and shows them off in an unbeatable way. No wonder it’s had over 700,000 views! We made this video for Flour & Grape to show off their homemade Tortelloni dish. It’s a firm visitor favourite, and they regularly get asked how they make them, so we filmed a short video to showcase that each of their parcels of pasta perfection are made by hand every day. If you’d like a similar video to show off your dishes, get in touch with us here. Since the dawn of the influencer they’ve been a feature in the top restaurant marketing ideas and strategies. These people give exposure you can only dream of getting for your restaurant. 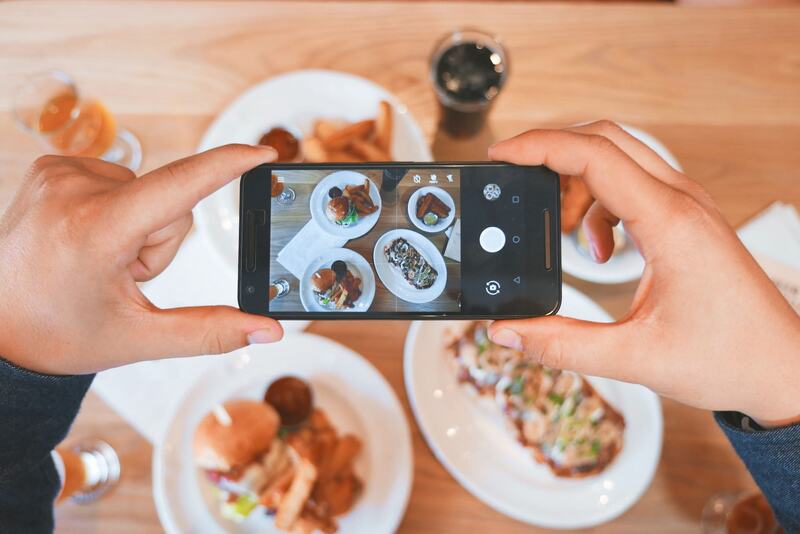 While you may have thought about using influencers in your restaurant marketing strategy, or maybe you’ve started to use them already, you’re probably only thinking about sticking to the big guns. These are the influencers who have hundreds of thousands of followers and can make your restaurant. 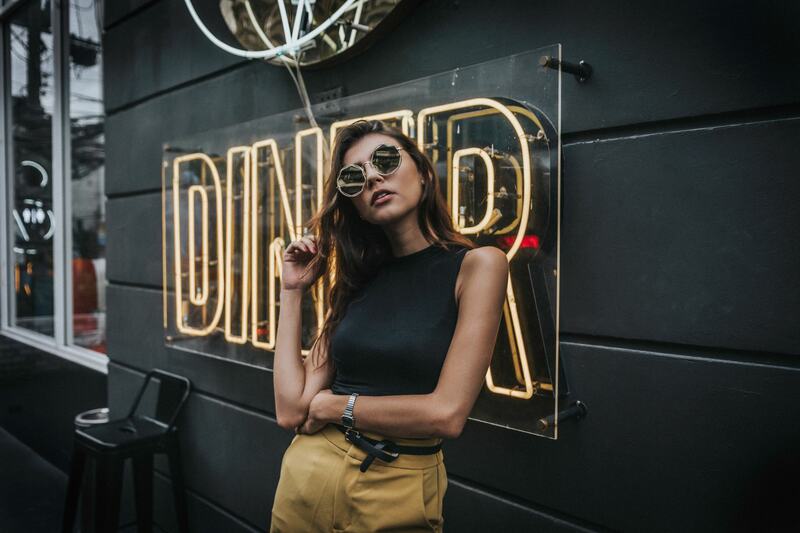 While getting a feature from one of your city’s top influencers would generate significant buzz for your restaurant, it isn’t something you should be focussing on. Instead, focus your attention on the micro influencers. These are people with less than 30,000 followers. Research by the New York Times found that these influencers generate the very best returns. These are the ones who will help get your restaurant noticed, liked, and busy - despite their smaller size. In fact, micro influencers generate 60% more engagement and 22.2% more conversions than macro influencers. That means getting these influencers to visit your restaurant can lead to more business than targeting only the biggest in your city. What’s more, it’s much easier to build a relationship with a smaller influencer than a big one. 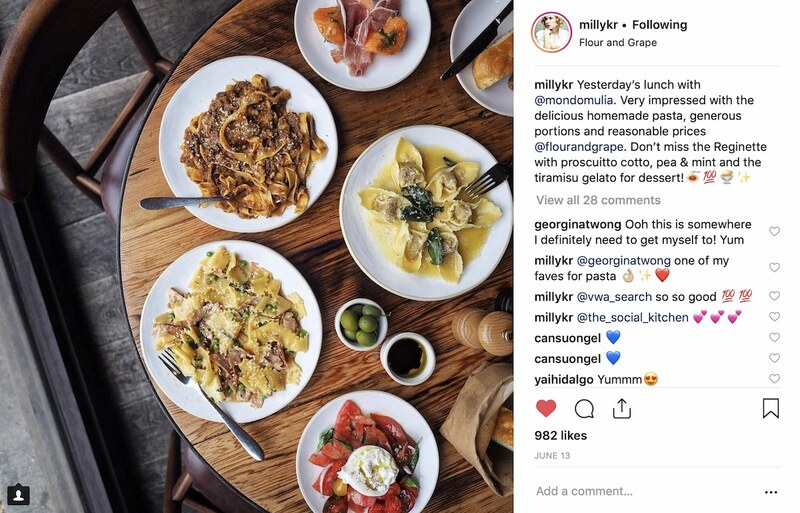 Unlike big influencers who are often paid with brand endorsements or who receive invites to events around the country or the globe, micro influencers survive on building relationships with restaurant owners like you. Getting success with micro influencers is straightforward. However, while many people think that micro influencer campaigns are easy to run and manage and are great to happen once, the reality is different. For your restaurant marketing strategy to be successful you need to run targeted micro influencer campaigns that get you coverage from the most relevant and appropriate influencers. If you don’t do this, you’ll find your coverage falls flat and doesn’t hit the right people. Be inspired by some of these influencer partnerships that helped propel these restaurants and bars to success. Look how each of them is with an influencer who is perfect for the restaurant and who takes fantastic photos that make the food shine. Milly Kenny-Rider worked wonders for Maade client Flour & Grape. We chose Milly because of her beautiful photos and the fact that her audience was a perfect match. The result is a perfect example of a great micro influencer campaign. The end photo showed off Flour & Grape’s food perfectly and generated significant interest. 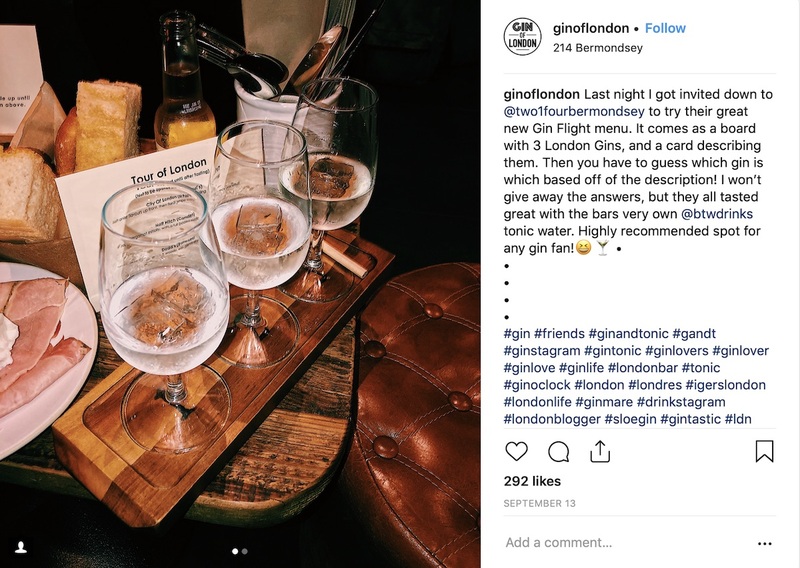 Niche micro influencer Gin of London was the perfect partner for Maade client Two One Four Bermondsey. The bar is renowned for its selection of over 100 Gins and Gin of London is an influencer dedicated to the Gin community. This partnership is an example of how going small is a great thing. Restaurants have relied on the monthly newsletter for a long time for a reason: they (somewhat) work. However, since the advent of GDPR here in Europe, restaurant newsletters have become less and less effective. If you’ve complied with GDPR properly, and you should have, you probably saw a big decrease in the size of your email marketing list. This is because many people were using GDPR as a way of cutting down on the number of emails they received. For restaurants especially, GDPR was a big hit. Many restaurants we work with and have spoken to saw big decreases in the number of email subscribers they have on their lists. Because of this, the traditional monthly newsletters just have less and less of an effect than they used to. This doesn’t mean email is dead, though. Instead, what it means is your new restaurant marketing strategy should feature something else: personal emails. Personal emails are emails that use personal data and information you have about your customers to improve their experience. These are things like: what dishes they ordered the last time they visited, how much they spent, what their wine choice was, and what cocktails they drank. These pieces of information are everything when it comes to knowing your customer. They tell you exactly what their likes and dislikes are and what they come to your restaurant for. You can use this information to help increase the relevance of your emails and make it so that people want to come back to your restaurant again and again. Do this by keeping track of what your customers order, what they drink, and more. Then, create targeted email lists that you can use to send out personalised emails that are relevant to each guests’ interests. These emails can be about new dish recommendations, information about wines on your menu, or more. Success with a personalised email restaurant marketing strategy comes through data. 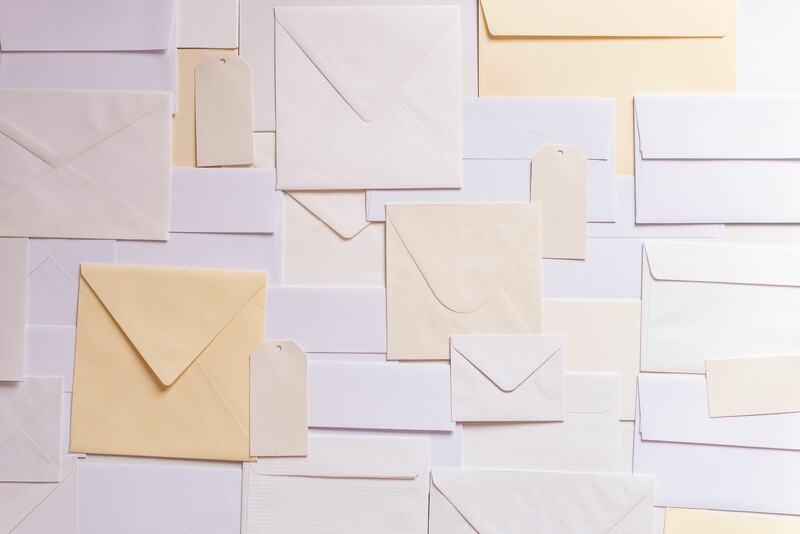 Keeping a note of what your customers are interested in will mean you’re far more able to send relevant and important emails that will get them back in your restaurant. Think of it this way: if 30% of your customers are vegetarian then sending 100% of your customers emails about your new meat dishes means potentially putting off 30% of people with irrelevant emails. Instead, keep track of your guests likes and dislikes and create individual email marketing lists with those likes and dislikes as your foundation. Then, send emails about vegetarian food to your vegetarian customers and emails about meat to your meat-eating customers! These 3 restaurant marketing strategies are perfect for helping to dramatically boost your restaurant’s business. Each of them will lead to success in 2019 and will help to make your restaurant busier and more successful. While implementing all 3 is the best option and the one that will get you the most success, starting with just one of these restaurant marketing strategies will still help you improve. The first two strategies can be done in just 10 minutes per day and can have a real impact on your business in the long term. If, after reading through this, you’d rather be in a safe pair of hands who have done this time and time again to great success, get in touch. Here at Maade we’re experts in implementing restaurant marketing strategies that get actual success. We’ve helped restaurants all across London dramatically improve their business through these strategies and more. We’ve helped people like Flour & Grape, Two One Four Bermondsey, La Tagliata, The Other Naughty Piglet, and more grow and progress. We’d love to help you expand your restaurant business and grow. Just fill in the form below and we’ll be in touch within 1 day to help you out.